The Indians, from tribes across the country, painted the streets with “blood”, marched through the city, demonstrated at government buildings, and called for their rights to be respected. 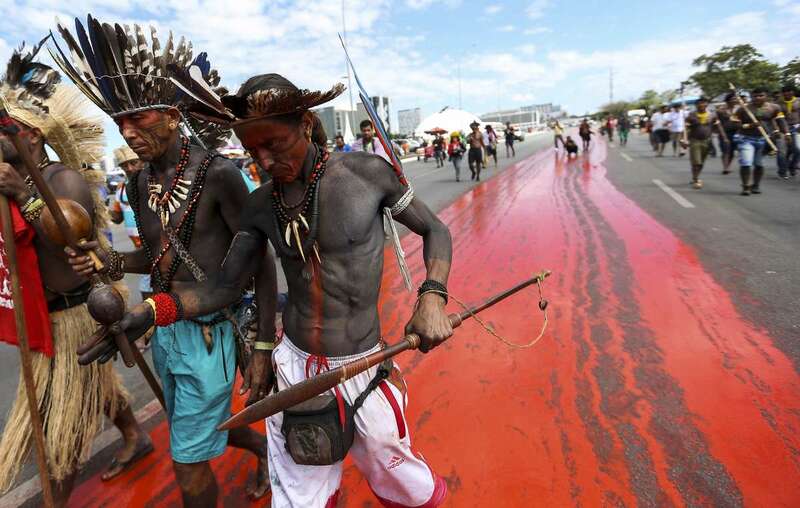 The protest marks Brazil’s “Indigenous April” and follows the annual “Day of the Indian,” 19 April, when the country’s President often announces some progress in the protection of indigenous peoples’ ancestral lands. This year, no such announcements were made. Instead, it was reported that the head of the government’s Indigenous Affairs Department would be replaced, as he was not fulfilling the demands of anti-indigenous politicians and ranchers. Politicians linked to the powerful agribusiness lobby are pushing through a series of laws and proposals which would make it easier for outsiders to steal indigenous peoples’ lands and exploit their resources. 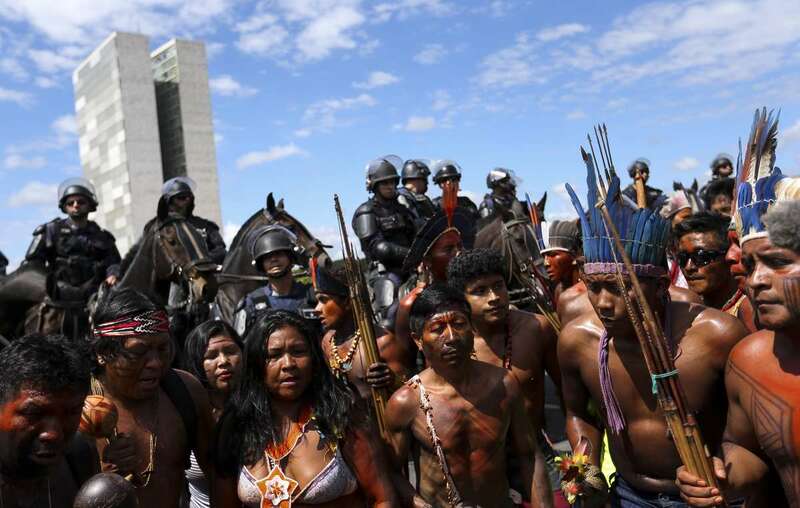 This would be disastrous for tribes across the country, including the Guarani, who suffer one of the highest suicide rates in the world, as most of their land has been stolen for cattle ranching and soya, corn and sugarcane plantations. And uncontacted tribes, the most vulnerable peoples on the planet, could be wiped out if their lands are opened up. Tribes like the uncontacted Kawahiva and Awá are on the brink of extinction as they live on the run, fleeing violence from outsiders. But if their land is protected, they can thrive. Survival International and its supporters in over 100 countries are working in partnership with tribes across Brazil to prevent their annihilation and the extinction of their uncontacted relatives.